One of CRYSTOBAL’s largest and most detailed kits, Vampire Killing Kit Druscilla is a prime example of the artistry, detail, and authentic style not found in lesser-made knock-offs. This kit was produced for a theater production and sold at auction for $1200. Created 2008. As with all of CRYSTOBAL’s kits, Vampire Killing Kits Druscilla exceeds all others of this style in workmanship, quality and artistic value. CRYSOBAL’s vampire hunting kits are known around the world. 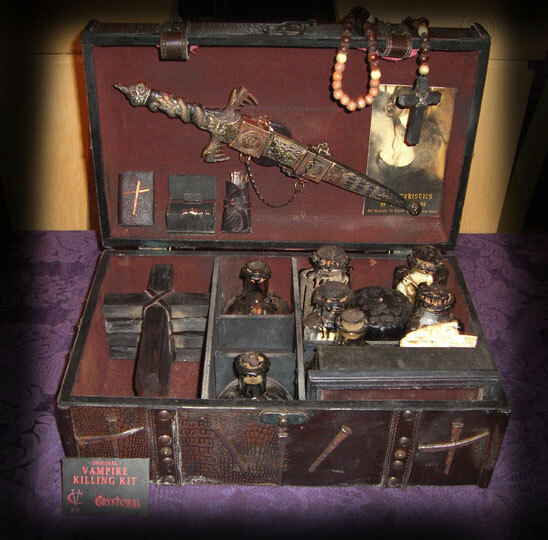 A Vampire Slayer Kit like this can be custom ordered starting at around $1200 and generally takes three to six weeks to complete. Optional accessories can be included for an additional fee. Options include antique or replica compass, pistol, spyglass, binoculars, monocular, maps, charts, sextant, magnifying glass, dental tools, mallet, crossbow, and more. Whether you are a fan of Buffy the Vampire Slayer, True Blood, or just enjoy anything of the occult, a kit like Vampire Killing Kit Druscilla would make an exceptional addition to your collection or shop.